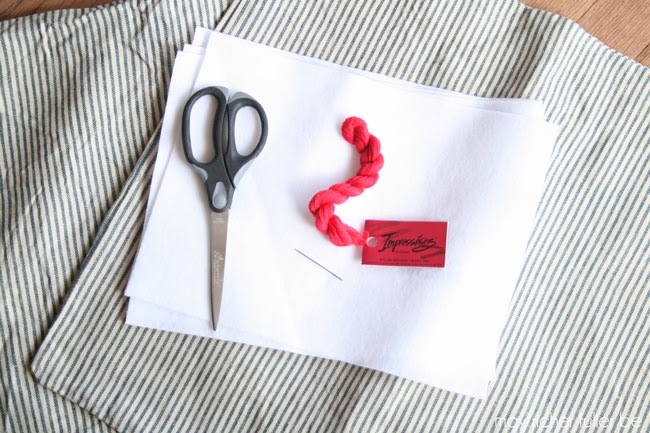 I've definitely been on a fabric kick with this 31 Days series, and today's "use what you've got" project involves more of it plus some felt and embroidery thread. 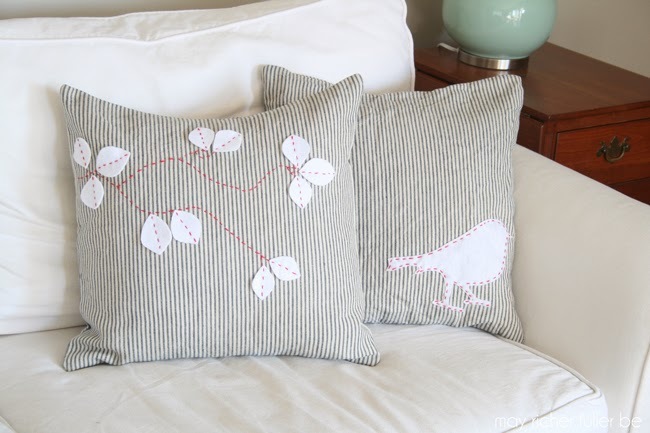 I embellished two (rather boring) old ticking stripe pillow covers I had with felt appliques. I put a cute little bird silhouette on one and a fall-esque leafy branch on the other. And you know what's fun about today's post? I'm sharing one of the little tutorials here on MRFB and the other one on Design, Dining and Diapers. So read on here about the bird silhouette and head over there to check out the fall leaves on a branch. 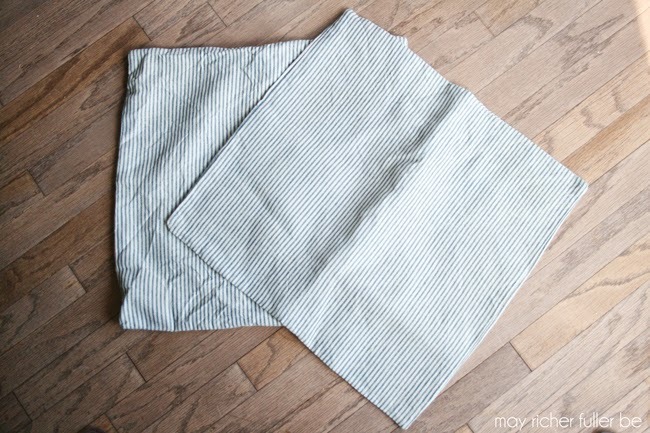 I've always liked a classic ticking stripe, but these pillow covers were so...plain. I made them years ago and they were just asking for something to make them a little more fun. Since I had two, I figured I could get a little creative and come up with a different design for each. 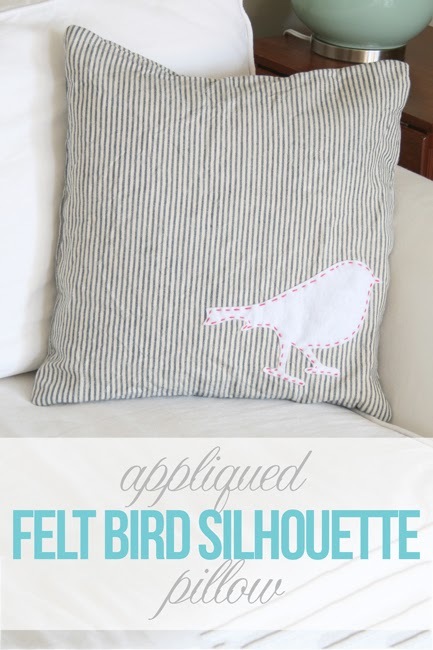 For the bird pillow, I Googled around and found a simple bird silhouette to trace. It looks like it's a robin maybe? Now, you could print out a piece of paper with a large version of the silhouette to trace, but I went the easy route and literally put the felt over my computer screen and lightly traced the outline with a pen. Since the computer screen is bright, it was easy to see the bird's outline through the felt. Call it the lazy gal's version of tracing :). Once traced, I cut out the bird shape, making sure to cut inside the lines so the pen line wouldn't show and/or bleed onto the pillow cover. Then I positioned it on the bottom right corner of the pillow cover and stitched it to the cover using a simple running stitch with red embroidery thread. I doubled the thread to make sure you could see it really well. Once I finished stitching a border near the edge of the bird, I tied off the last stitch on the back. 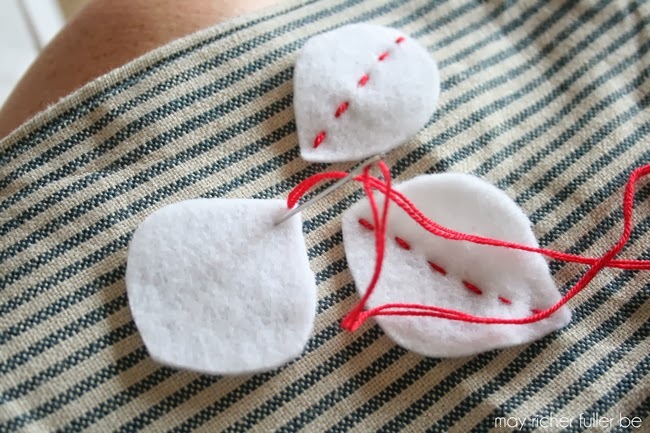 This "sewing" really is as simple as it looks in the photo - just make sure you begin on the underside of the pillow cover with the first stitch to hide the knot! I forgot to take a close-up photo of the stitching on the bird, so here's what it looked like on one of the leaves from the other pillow cover. Here's the finished pillow cover with the bird stitched on it! And here's a sneak peek of the other one I made with fall leaves on it. Remember to head over to Design, Dining and Diapers to see the full tutorial for that one! 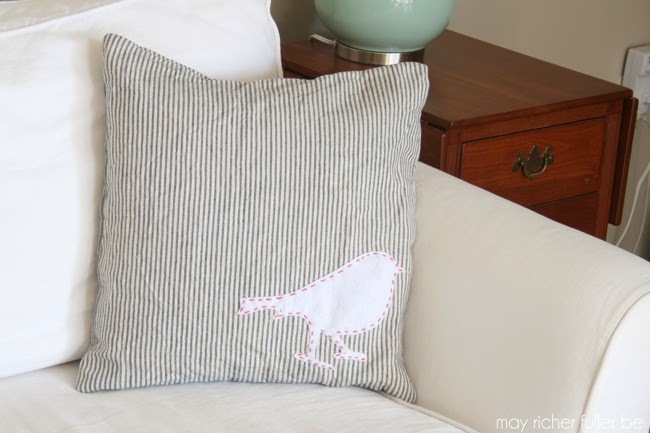 I love these classic ticking stripe pillow covers even more now that they have these cute appliques on them. And of course I loved using things I already had around the house (minus the felt - I did go and buy that) to do this project for cheap! These pillows are perfect for fall, but I think they'd transition nicely to the winter months to compliment Christmas decor as well - don't you think? OH I love this pillow too! It looks great with the one you shared on DDD. The bird is adorable and looks so chic. These are adorable and seriously... how clever are you to just put the felt up against the computer screen. I'll join you in the lazy gal's way. Love it! Amazing applique designing on the cushion covers. This is the creative artwork I have seen by machine embroidery. I am so obsessed with these colors right now! Great tutorial. Definitely making this! Pinning! You are really getting things done. Love you designing! !